With its two new high-speed monochrome MFP models, Sharp is taking aim at administrations and work environments with intense workflows. With print speeds of respectively 65 and 75 ppm, Sharp's new MX-M6570 and MX-M7570 machines offer performance particularly suited to the most demanding administrations and customers. With their 10-inch touchscreen and tablet-like menus, user interfaces are easy to use. Both models are easily compatible with cloud-based applications and storage services, for easier management of workflows. But speed is not the only asset of both machines: advanced finishing options, including a multiple folding unit will allow companies to create brochures very professional. And with the Sharpdesk® Mobile app, users will be able to print from their mobile device via WiFi. 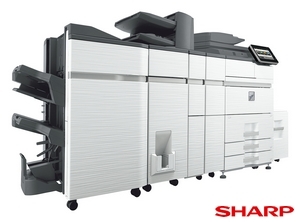 Shane Coffey, vice president of product management at Sharp said, "Sharp continues to drive innovation in the office by developing new document system products that raise the bar for multifunction copiers and printers." The new MX-M6570 and MX-M7570 Series Advanced Monochrome MFPs replace the Sharp MX-M654 and MX-M754 models and are available now from authorized dealers and dealers.